This Wednesday at 8.00pm, Saint Bartholomew’s will host Compline with a short reflection as part of the Rural Deanery of St. Ann’s Lenten services. This is an opportunity to pray together as a rural deanery. All are invited to join this short and reflective service, which lasts approximately half an hour and will be followed by refreshments. 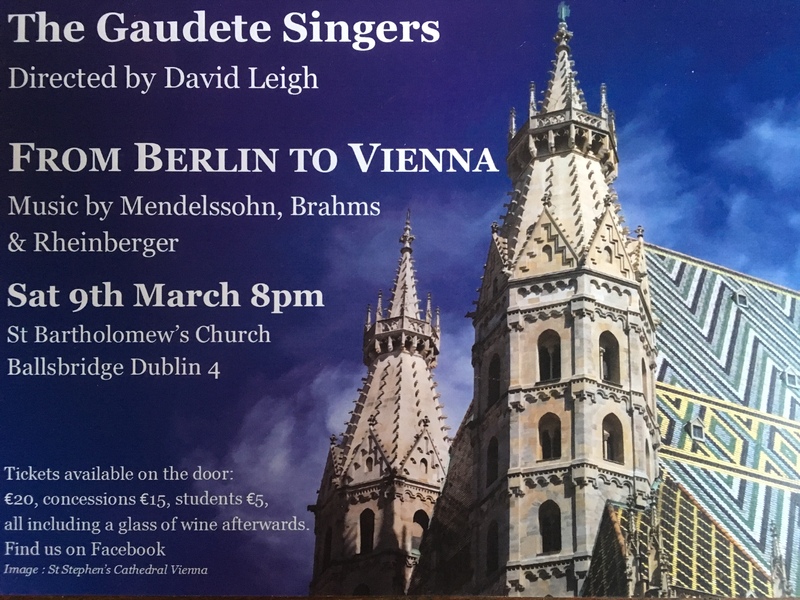 The Gaudete Singers return to Saint Bartholomew’s this Saturday for a concert of beautiful nineteenth century Romantic sounds from the German and Austrian traditions. Tickets on the door: €20; concession €15; students €5 with ID, all including a glass of wine or soft drink afterwards. Mendelssohn is often considered the greatest child prodigy after Mozart. He began taking piano lessons from his mother when he was six years old. At age eight, he studied composition with Carl Friedrich Zelter in Berlin and probably made his first public concert appearance at the age of nine. He was also a prolific composer as a child, and wrote his first published work, a piano quartet, by the time he was 13. The influence of Bach can be heard in the two works in this concert that were written near the end of his short life. 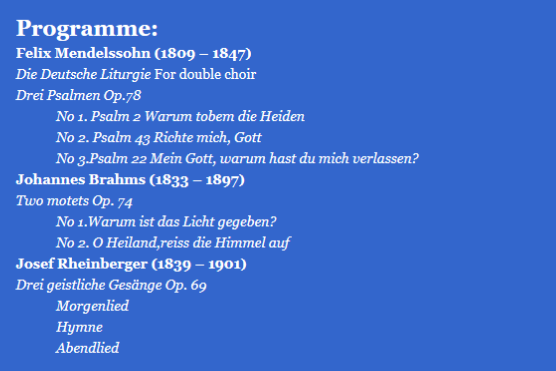 The Drei Psalmen were composed in 1843/4 and Die Deutsche Liturgie in 1846. Both works were composed for church services in Berlin Cathedral using a simpler style of church music for the new order of worship in Prussia. Brahms was also influenced by Bach and the Two Motets were published in 1878 with a dedication to the great Bach scholar, Philipp Spitta. Warum ist das Licht gegeben? was composed during the summer of 1877, at a time when the composer was putting the finishing touches to his Second Symphony. The first performance was given in Vienna on 8 December 1878. O Heiland, reiss die Himmel auf, in four parts, was composed earlier, between 1863 and 1864. Rheinberger is probably the least known of the three composers and his Abendlied is likely the best known piece performed in this concert. Rheinberger was also something of a prodigy and began playing the organ and composing at the age of seven. At 12, he was admitted to the Academy of Music in Munich where he studied with Franz Lachner, a close friend of Franz Schubert, and by the age of 15 he was gainfully employed as an organist. He spent 33 years as professor of counterpoint and organ at the Royal School of Music in Munich where the Drei geistliche Gesänge were composed in 1855. 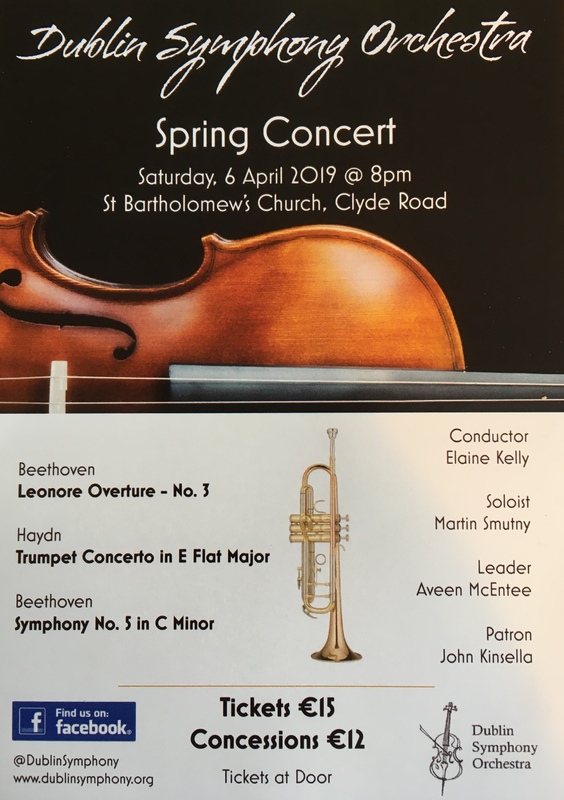 We hope to see you this Saturday, and please join us for a glass of wine after the concert (included in the ticket price). Saint Bartholomew’s is proud to host this year’s Women’s World Day of Prayer service on Friday, 1 March at 3.00pm. This service is part of a global event held annually on the first Friday in March. 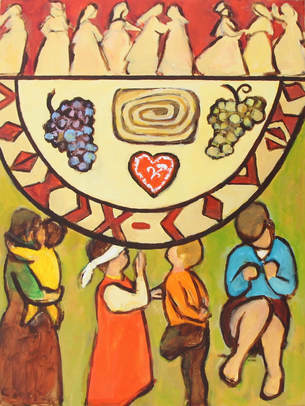 The Women’s World Day of Prayer is the largest ecumenical movement in the world organised by women, and the churches in Ballsbridge/Donnybrook take turns hosting the event in our area each year. The service for 2019 has been written by the Christian women of Slovenia and its theme is “Come—Everything is Ready!” All parishioners—not just women!—are warmly invited to attend. The service will be followed by refreshments in the parish room, to which everyone is welcome. It has been five years since Saint Bartholomew’s had the honour of hosting this special event, so do please come along and show your support! For more information, please visit https://worlddayofprayer.net/slovenia-2019.html. Saint Bartholomew’s is pleased to welcome back Encore Voices, who will perform Puccini’s Messa di Gloria this Saturday, 9 February at 7.30pm. 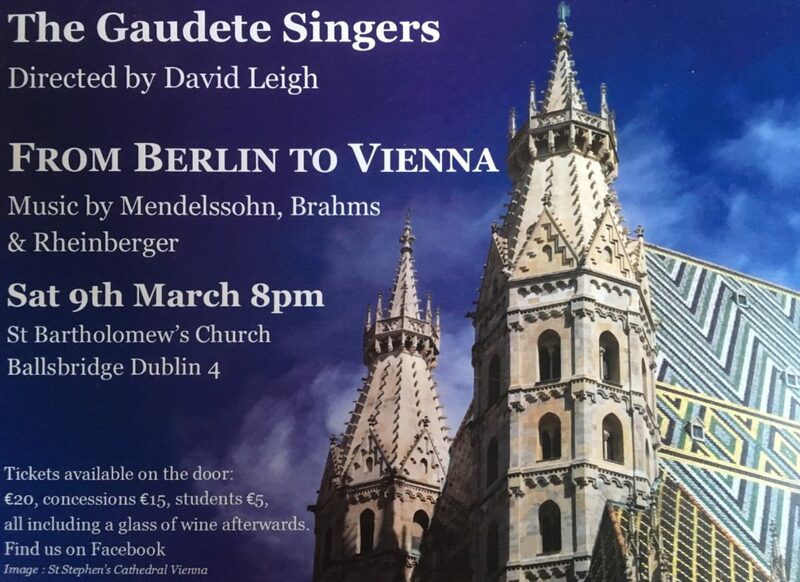 Led by conductor John Doyle, the singers will be accompanied by a quartet and Maria Geheran on piano. Tickets cost €15 (student/OAP/unwaged €10; child €5) and may be purchased at the door. We want to update and thank the congregation and supporters of Saint Bartholomew’s for your continued patience as we work to realise the publication of Dr. Kenneth Milne’sThe History of Saint Bartholomew’s–1867-2017. The research and writing stages are now complete and we have moved on to the editing, design, and proofreading of the final layout. Some exciting information uncovered during research in the National Archives includes the location of the parish school (which had 76 pupils at one stage). From the Lambeth Palace Library in London comes the text of the sermon Archbishop Ramsey preached at Saint Bartholomew’s in 1967. Newspaper cuttings show the courtesies extended by John Charles McQuaid,the Roman Catholic Archbishop of Dublin, to Dr. Ramsey. The appendices listing office holders have been updated through the work of the RCB Library committee. When the first edition of Dr. Milne’s book was published, the National Archives did not exist. The flowering of historical scholarship over the last 50 years, not least by Dr. Milne himself, has provided a wealth of source material not previously available. The first edition text has been modified in some places to take account of these new insights. All of this material, together with Alistair Rowan’s treatment of the building from an architectural and art historian’s viewpoint, has now been integrated into a single text. 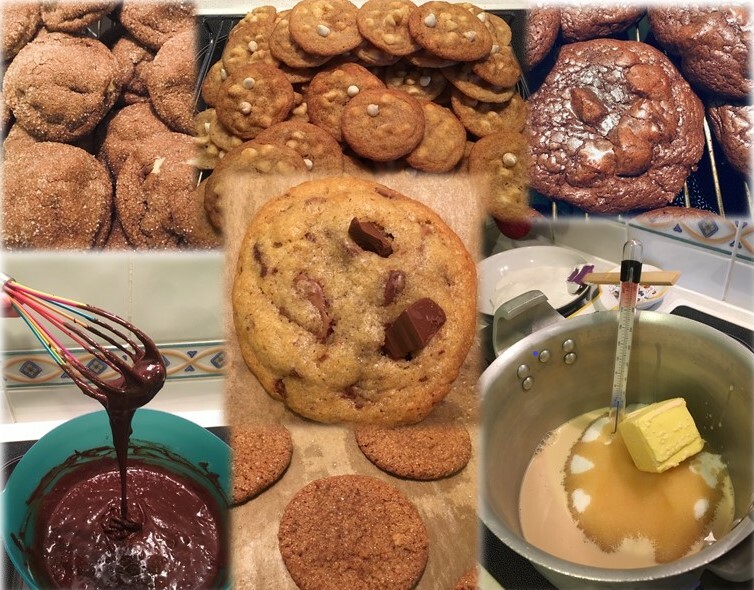 It is hoped that the book will be ready in the first half of 2019, perhaps by Easter. If you would like to purchase a copy, please contact the parish administrator at admin@stbartholomews.ie or call 01-668-8522. For €25, you will receive a copy of the book. For €50, you will receive a copy of the book signed by the author and your name will be included in a list of supporters. 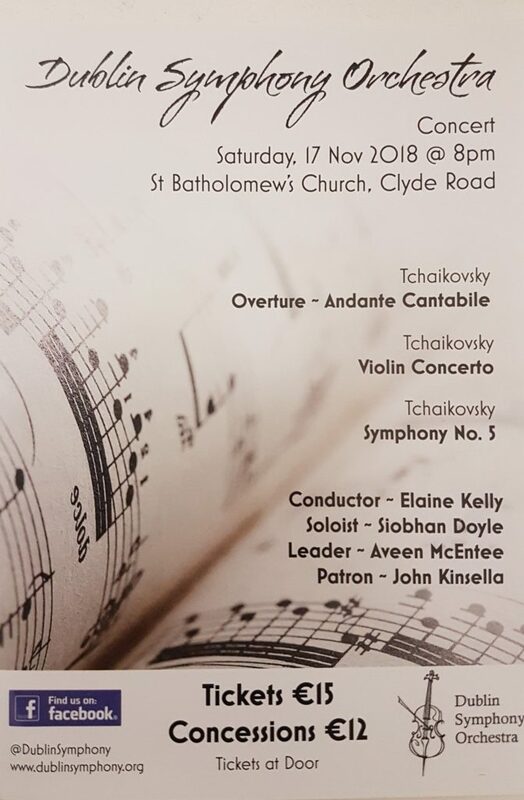 The Dublin Symphony Orchestra returns to Saint Bartholomew’s this Saturday for their winter concert! This year’s all-Tchaikovsky programme begins at 8.00pm. Tickets are €15; €12 concession, and may be purchased at the door.